Heating/Cooling Start Temperatures define the outdoor air temperatures at which a building owner will begin operating their heating or cooling system. In ASHRAE manuals and HVAC books these are referred to as Balance Point Temperatures because they are typically calculated as the temperatures at which the energy lost is perfectly balanced with the energy gained either to or from the space. In the latest LoopLink release, we added the ability for users to control their Heating/Cooling Start Temperatures in an effort to offer more granular control to the geothermal system designer when specifying the operating conditions of each zone. Heating start temperatures are calculated as a function of your peak heating load, your building type and your specified heating offset for the zone. Cooling start temperatures are just a simple input that accepts values from the default cooling start (defined by selected Building Type) up to 80°F. 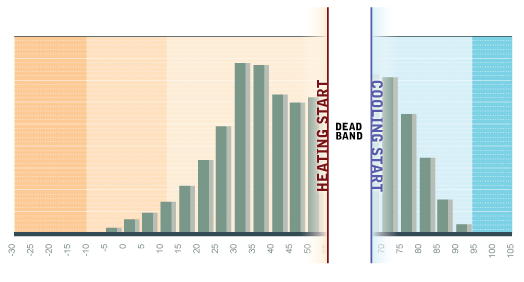 The difference between the heating and cooling start temperatures is known as the ‘dead band’. This ominous sounding term just reflects the fact that the geothermal system is not running and is represented on the Zone Load and Operating Profile graph as the thin white area. This unassuming bit of space contains bins and each bin represents the amount of time per year, in your design location, the outdoor air temperature will fall within a specific 5°F temperature range. LoopLink looks at each bin and calculates the amount of energy that will be needed to maintain the specified set point temperature. So, the more bins that fall within your dead band the fewer number of bin hours LoopLink will analyze and add to your equipment run time. This level of control allows you to more closely match your design to how your customer will actually use the space. For example, in most homes the air conditioner isn’t going to be turned on until outdoor air temperatures are well above 65°F or 70°F, especially if it isn’t humid out. People will open their open windows and cool their homes for free. In the past LoopLink simply used your specified Gain Level (now Building Type) to assign a heating and cooling start temperature to all zones in your project. This makes for systems that are conservatively designed but can result in slightly skewed equipment runtimes which can adversely affect operating cost estimates and long term savings estimations. With the new heating and cooling start temperatures you can match your designs to your customer’s behaviors giving you, and them, more realistic estimations of performance and long term costs.